Route based monitoring with handhelds are extremely cost effective in monitoring the hundreds of pieces of equipment necessary to keep a plant up and going. But when a mechanical defect event has been identified and production needs to keep going, continuous monitoring gives you the ability to continue production without destroying machinery or affecting quality. Riotech's portable systems allow you to set up an online system in minutes. Riotech's portable monitoring systems give you the ease and flexibility of installation you need at a cost you can afford. Operators, managers and analysts from time to time all wished they could afford an online system to watch critical and questionable equipment more closely, without committing personnel to run out every couple of hours with their handheld. Unfortunately in the past, online systems took large commitments and acceptance from all different levels of management. Riotech portable online systems allow you to set up an online system and start monitoring almost immediately by just setting a box next to a bad actor, attaching sensors, plugging in some power and clicking find NCA from your desk or laptop. The Power of Choice - Because you never know where you will need to set up a portable online system, Riotech Instruments offers multiple methods of connecting your equipment and our monitoring software. The VMU208R-802-SYS is perfect if your plant already has 802.11 Wi-Fi installed on the plant floor. Riotech's Rioserver software can connect directly to the VMU without any other equipment. The VMU208R-900-SYS is for when there are no wireless routers on the plant floor or when a WiFi signal is out of range or in the field away from a wireless network. The included 900 Mhz spread spectrum frequency hopping radios are powerful enough to meet the most demanding applications. 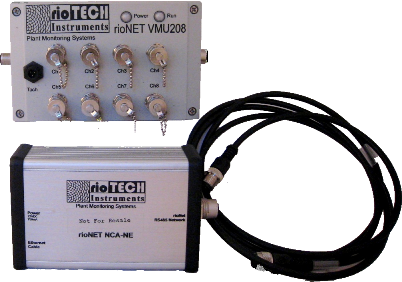 A VMU208R-MBL-SYS uses the same technology that your cell phone uses. For equipment spread out over a region such as pipeline compressors and engines or utility pumps and lift stations. Anywhere there is cellular service, vibration data can be acquired from a "bad actor" where it can be monitored and viewed at your desk. No matter what your needs - portable, online, or handheld - Riotech Instruments has the solution.